This run is named hangover because it is on January 1st. AND there were some folks that looked like they had a hangover for sure. It started in San Juan Capistrano and went over Ortega Highway. 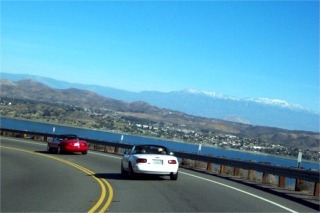 Ortega highway is normally pretty busy so the speed is kept down somewhat by California standards. But this day we were moving along pretty good. 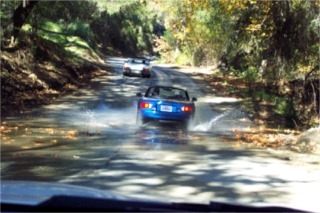 It is a wonderful twisy road that goes over the Santa Ana mountains. 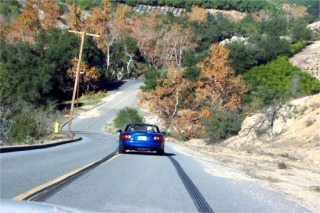 Then after a break we headed into the De Luz Road twisties. It was a fabulous day in the upper 60's and low 70's and in the winter the air is pretty clear. Note the snowcapped mountains in the picture to the left. 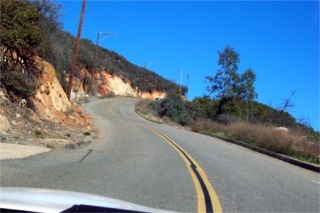 This stretch of road is characterized by steep up and downhills with sharp corners. It features one section with a 28% grade. Normally when I take up and downhill pictures you can't really tell it. But on these photos you can because they are so severe. The run ended in Temecula where we had a late lunch at the 5 and Diner. Look for one near you because it's a great place to eat. This run is the largest one of the year for our club because we open it up to a few other car clubs. There were some Honda S2000's, Mazda RX 7 and 8's and a few Porches. We had 115 cars show up total. The picture below shows the group but it's hard to tell there are actually 3 rows of cars in it.